Interesting thing about very old opera done with imagination and zeal: It comes back to life with the energy and edge it must have borne when it was new. That’s the experience of witnessing the 28-year-old Handel’s opera seria “Teseo” in a vibrant and vocally polished production from Chicago Opera Theater. 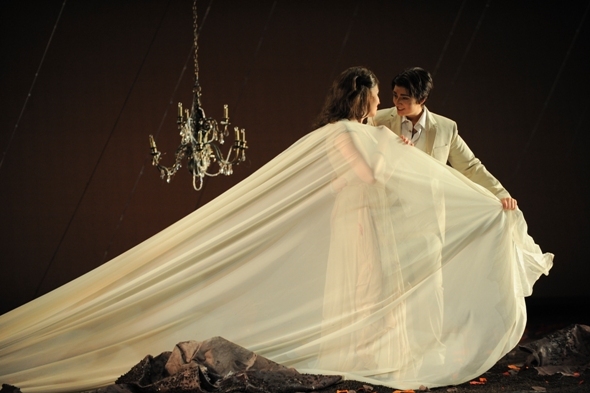 “Teseo” (or “Theseus”) marks the final installment in the company’s Medea triology after Cavalli’s “Giasone” (“Jason”) in 2010 and Charpentier’s “Médée” last year. Medea, for anyone who might need to brush up, is the ultimate femme fatale from Greek mythology who – in her most notorious gambit – took such umbrage at her betrayal by Jason that she slaughtered their children and sent a poison gown to the princess he planned to marry. That was all back in Corinth, whence she promptly flew off in a golden chariot to Athens, where we find her in Handel’s opera. Once again, never minding the title, it is ill-tempered, ruthlessly vengeful Medea around whom events turn. She is betrothed to Egeo, king of Athens, who much like Jason dumps her for the pretty young Agilea, whose heart belongs to the warrior hero Teseo. Medea’s response is to lay claim to Teseo, invoking her black arts to torment and subdue all who would resist her plans. 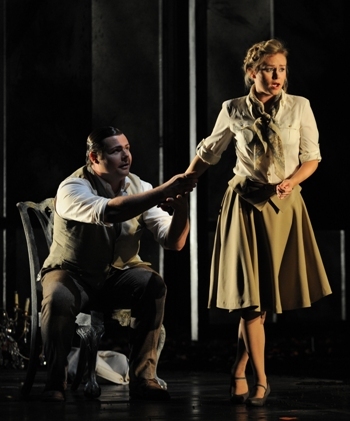 In the end – which I feel OK about divulging as the opera is some 299 years old – true love prevails. I am leaving out a tiny detail of this happy resolution, but even after three centuries an audience is entitled to at least one surprise. “Teseo” is hardly an action opera. It would not be too far amiss to say that nearly every “event” happens on a psychological level. All the more credit, then, to stage director James Darrah, who has captured the opera’s almost unrelenting emotional intensity through a modernist fusion of dreamscape and magic. The real magic – even eclipsing Medea’s – dwells in Handel’s breathtaking vocal score with its profusion of ensemble numbers each, it seems, more thrilling than the last. The third of Handel’s London operas, “Teseo” displays the formal structure and florid vocal style the young composer had mastered in Italy. What transcends those norms is Handel’s inexhaustible lyrical gift, together with an expressive sensibility that is still disarming today. And the greatest pleasure of this production is the uniformly splendid singing, artfully indulged by Michael Beattie’s conducting and adroitly supported by Chicago’s Baroque Band playing on period instruments. As the two women vying for Teseo’s affections, mezzo-soprano Renée Tatum (Medea) and soprano Manuela Bisceglie (Agilea) offer a compelling perspective on drama as a lyrical art. Tatum’s commanding stage presence is matched by a voice of imperial authority. In contrast, Bisceglie’s Agilea, besieged and desperate to escape the king’s clutches, sings from the heart to the heart in a voice as unfailing in its tenderness as in its agility. That said, mezzo-soprano Cecelia Hall’s ringing coloratura as Teseo left no doubt as to why Handel named his opera for this object of two women’s adoration. Statuesque and poised, Hall strode about the stage with the easy confidence of a tested soldier. Vocally, she sounded just as assured, gliding effortlessly through music of imposing technical demands. In the black-hatted role of Egeo, the cad who tosses Medea aside and commandeers Agilea from her true love, countertenor Gerald Thompson displayed vocal warmth that nearly made one forget the king’s dastardly intent. As comic foil to all this headlong rage and ruin, countertenor David Trudgen and soprano Deanna Breiwick made a charming pair of panting lovers-on-the-sly. From a purely vocal standpoint, these lower-class characters were absolutely patrician. Set designer François-Pierre Couture’s starkly mystical décor and James Darrah’s commingling of ancient and modern costumes added a sharp accent to the opera’s Baroque birthright, and to its timeless piquancy. Background of the Medea myth: Read it here. Found this a beautifully – performed production. But, what’s with those chandeliers? I remember last year in Medee they were in plexiglass boxes. Supposed to be stars? There was that beautiful moment last season at the Lyric’s Ariadne as her final apotheosis into a constellation, but I’m not sure about the designer’s thinking in this production. Some of the visual effect were stunning, including the long sheer cape at the wedding( I trust they made sure there ware no nails in the floor). There was nice subtle reference to last season with this year’s backdrop’s hinting at the swooshes of the floorboard or whatever they were. We will, of course miss Mr Dickie, but I believe he has put COT on a solid and well-respected course. Now, if they only make the Harris not such an ugly venue with too many steps. An improvement over the (then) fire-trap Athenaeum, I guess.